Lionfish caught during the Sarasota Lionfish Derby are on ice during the culminating event on July 10 at Mote Marine Laboratory. 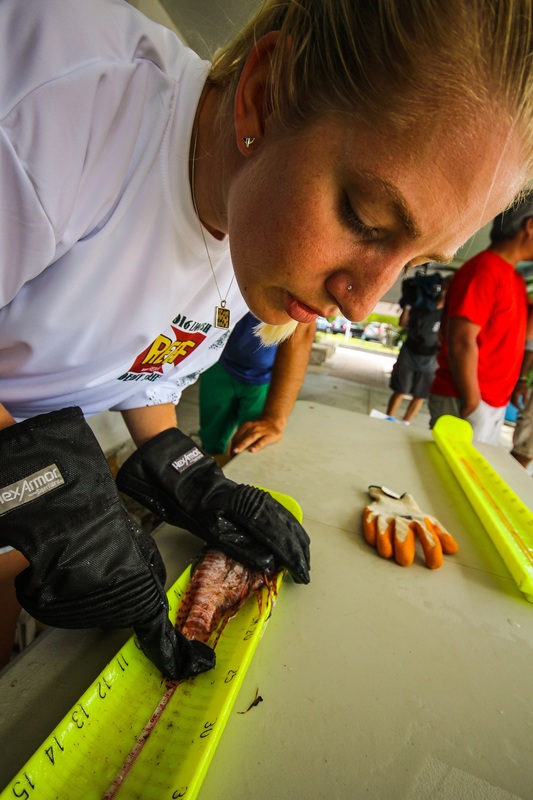 Divers removed 429 invasive lionfish from the Gulf of Mexico during the third annual Sarasota Lionfish Derby, which drew more than 300 visitors to its culminating event today, July 10, at Mote Marine Laboratory. The Sarasota, Florida-based derby was a partnership effort among Mote, a world-class marine science institution, Reef Environmental Education Foundation (REEF), which helps study and address the lionfish invasion and sanctions official Lionfish Derbies, and ZooKeeper, the leader in lionfish containment throughout invaded areas. This was the first derby in the 2016 Summer Lionfish Derby Series coordinated by REEF. Three upcoming derbies are accepting registrations at: www.reef.org/lionfish/derbies. During the Sarasota derby from July 8-10, six teams of 19 Florida divers vied to catch the most lionfish, the largest lionfish and the smallest lionfish in Gulf of Mexico waters ranging from Collier to Escambia County. On July 10, more than $3,500 in total cash prizes were awarded to first, second and third place winners in each category during an awards ceremony that filled Mote’s WAVE Center to capacity. Leading up to the ceremony, top local chefs from Indigenous Restaurant, Mattison’s Restaurants & Catering, Seafood Shack and Beach House prepared tasty lionfish dishes for the public. The Indo-Pacific lionfish (Pterois volitans) has invaded coastal habitats of the western Atlantic Ocean over the past two decades and has the potential to cause major ecological changes in reef fish communities. These efficient predators are venomous, reproduce frequently and year-round, and they pose a major threat to Florida’s native species and ecosystems. They consume more than 120 different species of fish and crustaceans, and in heavily invaded areas they have reduced fish populations by up to 90 percent and continue to consume native fishes at unsustainable rates. 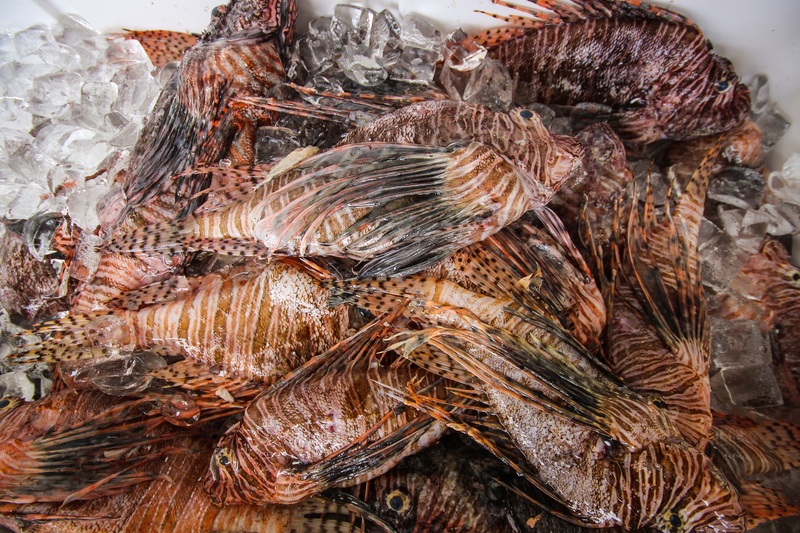 The only controlling predators of the invasive lionfish in Florida appear to be humans — and the fish are delicious to eat. Lionfish derbies are an important way to educate and encourage divers and snorkelers to harvest large numbers of this invasive species, which has spread along the eastern Atlantic coast, through the Caribbean Sea and Gulf of Mexico. The Sarasota Derby culminated today, Sunday, July 10, with a celebration on the premises of Mote on City Island, Sarasota. There, the public visited educational booths about lionfish, checked out gear designed to capture them and watched lionfish be counted and measured by REEF staff and dissected by Mote scientists. 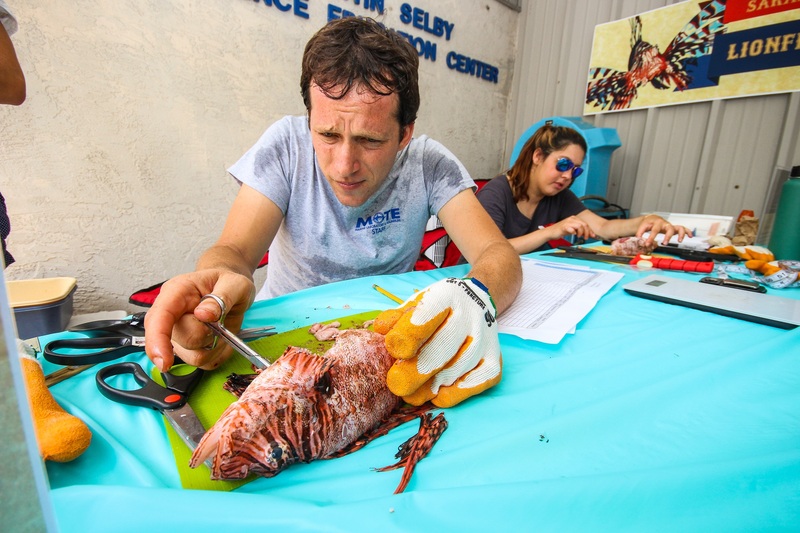 Lionfish captured during the Sarasota Derby were measured carefully and their stomach contents were examined by Mote scientists. Collecting data on local lionfish populations year after year helps scientists study population dynamics, behavior and adaptations over time. “Beyond the Gulf of Mexico, we are also interested studying lionfish in their native habitat, the Red Sea, where very little is known about their ecology and behavior,” said Dr. Noam Josef, a postdoctoral research fellow at Mote who is working with colleagues from Ben Gurion University in Israel to study the spatial distribution, movement, behavior and ecology of lionfish in the Red Sea. “Such a pioneering study, along with efforts in the Gulf, may yield insights on resiliency and weak points of lionfish, along with potential insights on how to sustain populations of the native fishes affected by the invasion. The physical characteristics we measure at this derby will be compared with those from native populations. Comparative studies may be key to understanding what made this species such a successful invader." Filets from derby-captured lionfish were transformed into delicious hors d’oeuvres by Chef Steve Phelps from Indigenous Restaurant, Executive Chef Gerard Jesse from Seafood Shack, Chef Paul Mattison, Executive Chef and proprietor of Mattison’s, and Erik Walker, Culinary Director of Beach House. “We’ve had a pretty amazing turnout, and I’m glad we teamed up to do this,” Phelps said. “I think the awareness of lionfish has gotten so big, chefs are paying attention, and we’re educating a whole city. By the end of today, more people will have learned about it.” Phelps used sea purslane grown in the sustainable, marine aquaponics system at Mote Aquaculture Park in his lionfish ceviche dish during the event. Once the derby results were in, REEF staff kicked off the awards ceremony with a raffle, and Mote President & CEO Dr. Crosby welcomed guests. The public can help document the lionfish invasion by reporting sightings through REEF, U.S. Geological Survey or the Florida Fish and Wildlife Conservation Commission (FWC). FWC has a Report Florida Lionfish app available for smartphones. REEF also has a free Lionfish Sightings App for iPhone, which allows people to track and record lionfish sightings all around the invaded region. 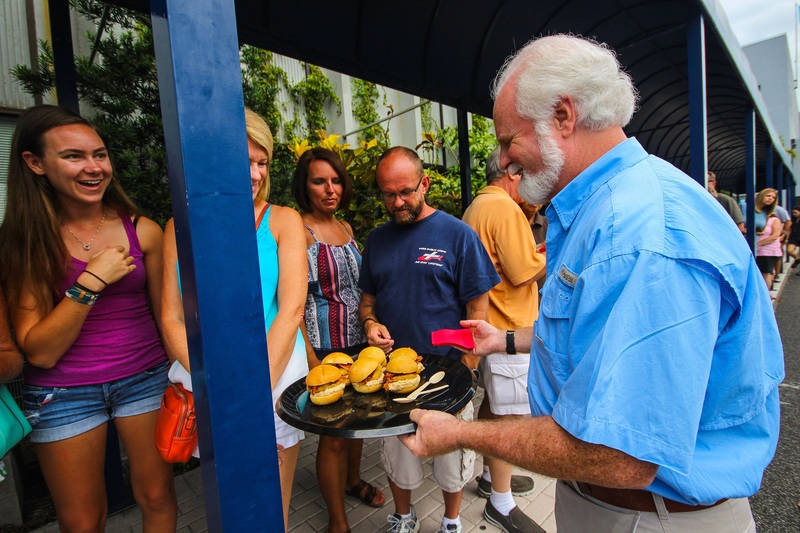 15th Street Fisheries & Dockside Café, Florida Fish and Wildlife Conservation Commission, Florida Keys National Marine Sanctuary, Florida Park Service, Loggerhead Marinelife Center, Mote Marine Lab and ZooKeeper. Beach House; Big Water Fish Market; Edible Sarasota; Gold Coast Eagle Distributing; Indigenous Restaurant; Mattison’s Restaurants & Catering; Monterey Bay Aquarium; Seafood Shack; and The Florida Aquarium.